The gap between iOS and desktop music production gets increasingly narrow with every passing year. The best iPad and iPhone music production apps on the Apple App Store can easily hold their own against their Mac and PC counterparts, and with a growing number of DAWs making the jump to iOS in some form or other, mobile music-making is now more of a serious proposition than ever. While iPhones and iPads are both solid music-making platforms, they are somewhat lacking in the I/O department - especially since Apple removed the headphone port on its more recent iPhones. As a result, if you want to get quality audio in or out of your devices, or control instruments with anything other than the device’s screen, you’re going to need to invest in some kind of compatible hardware accessory. Below, we’ve rounded-up 10 of the best hardware peripherals that are designed to help you create, record and edit music with your iOS device. From the best iPhone and iPad audio interfaces to portable MIDI keyboards to DJ controllers, here you’ll find accessories to cover all your mobile music-making needs. IK Multimedia has been one of the most proactive brands in the realm of iPad and iPhone music peripherals, and its iRig range now spans a wide variety of interfaces and controllers to suit a multitude of needs. The iRig Pro I/O is a solid ‘workhorse’ iOS accessory, offering an audio input that’s suitable for both instruments and mics (with phantom power available) as well as MIDI In and Out for sending and receiving control messages. There’s a headphones port, too, which means you can monitor your input even on newer iPhones that lack their own output. The iRig Pro I/O comes with a generous bundle of desktop and iOS software as well, including several effects and instruments for IK’s range of plugins and apps. In short, it's an excellent choice if you want an audio and MIDI interface for iPad or iPhone. Korg’s compact MIDI and audio interface is an incredibly handy device for anyone who regularly uses iOS synths and instruments. With a MIDI Input and stereo jack outs, it effectively turns those digital synth apps into studio-compatible instruments, enabling you to easily hook them up in the same way you would any other piece of MIDI-equipped hardware. It also features a separate headphones output and micro USB input, allowing users to charge their iOS device at the same time as taking an audio output - something which isn’t usually possible with recent headphones port-free iPhones. If you’re looking for a simple way to expand the capabilities of your favourite instrument apps, PlugKEY is certainly worth checking out. The name is a bit of a mouthful! Pitched as a bridge between the iOS and desktop realms, the iConnectAudio4+ allows for simultaneous connection to two devices, in any combination of Mac, PC or iOS product, with the latter supported via a supplied Lightning connector cable. It packs impressive I/O capabilities, too, with four inputs, four outs, a separate headphones out and MIDI In and Out. It also has a neat touch-sensitive control surface for adjusting levels and settings. With impressive MIDI and audio capabilities running hand-in-hand, this is a box to underestimate at your peril. It represents perhaps the most joined-up solution for bridging iOS and studio needs to date. Described by IK Multimedia as its “all-in-one music production station”, the iRig Keys I/O combines a MIDI controller keyboard (a smaller 25-key version is also available) and audio interface in a single unit. It’s designed to be as compact as possible without compromising on playability. It’s built with iOS in mind but also works very well with desktop systems. The IK iRig Keys I/O 49 is small enough to find a space on even the most hectic of studio desks, and is equipped to handle basic recording duties and general purpose MIDI control on stage and in the studio. As a package, it’s comparatively good value, too, particularly taking into account the impressive bundle of desktop software that comes free with it. This includes T-RackS effects, SampleTank 3, Syntronik Pro-V and more. The Rode iXY Lightning is an extremely compact stereo microphone for recording to Apple mobile devices, offering a 'locked' X-Y recording configuration at sample rates up to 96kHz and a resolution of 24-bit. The recorded results are rich, high-quality and hugely impressive. Once clipped to your phone, recordings are easily made to one of Rode's own Rode Rec apps, which are available either in full (paid) or basic 'LE' forms. While £169 might seem like a lot for an iPhone accessory, the iXY is more than capable of delivering pro studio-style results. NI’s Z1 is the same size and shape as its popular F1 and X1 controllers, but the layout is that of a traditional two-channel DJ mixer, complete with a built-in audio interface for monitoring. The main difference from other Traktor controllers is that the Z1 is designed for use with the brand’s Traktor DJ app for iOS as well as the main desktop version. A Z1 paired with an iPad or laptop makes for a powerful but extremely portable combination. Advanced DJs may want to add other devices for extra control, but could still use the Z1 when travelling light. While more controls would be nice, it would add to the cost and size of the unit. Overall, the Z1 does what it does very well. The MV88 is a stereo condenser mic that plugs straight into your Lightning-equipped iPhone or iPad. It has two 1cm capsules in a mid-side configuration, with 90-degree hinge and rotation of the overall capsule. The mic incorporates AD conversion (16-bit/44.1kHz or 24-bit/48kHz) but no headphones output, and needs Shure's free MOTIV app for proper use. This provides adjustment of mic gain, mic pickup pattern (stereo, mono cardioid, mono figure 8 and raw mid-side) and M/S balance for the stereo option. There are also five DSP presets, an LF cut to reduce wind noise, L/R channel swap, and basic processing (EQ, limiter and compressor). The most basic and straightforward peripheral on this list, but arguably the most useful, Apple’s Camera Adapter simply enables users to connect USB accessories via their device’s Lightning port. The reason this is useful is down to the fact that a growing range of general studio products - including lots of interfaces and MIDI controllers - now offer class-compliant compatibility with iOS, meaning that you may be able to use some of your existing gear with your favourite apps. Useful as it is, it’s certainly not cheap for a straightforward converter. It’s possible to pick up unofficial versions for considerably cheaper, although it’s worth bearing in mind that we’ve experienced compatibility and reliability problems with some non-brand iOS adapters in the past, so these don’t come risk-free. English brand ROLI has made a name for itself with its Seaboard range of ‘multidimensional polyphonic expression’ (MPE) controllers. In a nutshell, these allow for expressive playing and modulation of sounds on a note-by-note basis, providing an experience more akin to an orchestral instrument than a standard MIDI controller. The Blocks range brings this technology to a more affordable line of Bluetooth controllers, which are designed to work with both a growing array of desktop plugins and ROLI’s own Noise app for iOS. This second generation version of the company’s square Lightpad controller is a unique, expressive and approachable controller that allows for a whole assortment of playing and control gestures from its simple silicone interface. Noise itself is great as a sound player, although it’s still a little lacking in pro-level sequencing and editing features. Still, you’d be hard-pressed to find a more creative controller for your iOS device. Focusrite’s iTrack One Pre does exactly what its name would suggest - offers up a single preamp-equipped input for recording into your iOS device. Its combination jack/XLR input is ideal for either a guitar/bass or microphone, and it will even supply phantom power for use with condenser mics. A large central gain knob lets users adjust the input level, and also uses a light ‘halo’ to indicate level clipping. The main downside to the One Pre is its lack of a headphones output. This isn’t a problem for users of iPads and older iPhones, which have their own dedicated headphones output on the device. It does mean, however, that when used with a newer iPhone there’s no way to directly monitor the input. 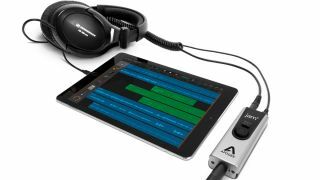 The premise of Apogee’s Jam interfaces has always been simple: to give guitarists and other instrumentalists an easy way of recording at high quality into their Mac or iOS device. Following the releases of the original Jam and Jam 96k, the Jam+ promises to set a new standard for the range. As with previous versions, the Jam+ is a compact device, but this time it comes in an all-metal chassis. Audio quality has been improved thanks to the inclusion of PureDIGITAL circuitry, and a headphone output has been added to the mix, too. This will be of particular use to owners of newer iPhones, which don’t have one of their own. On the recording side, there’s now a Drive Mode, which is designed to add a “rich, warm overdrive” to your tone. Obviously, this has been implemented with guitarists in mind, but there’s nothing to stop keyboard players from using it, too. There’s also a Blend button that enables zero-latency monitoring, and the input gain can be adjusted with the twist of a knob. If you can do without MIDI, this is a great choice of iPad and iPhone recording interface, particularly for guitarists.